One of the supplements that you might not be as familiar with, but is still really important to have, is L-carnitine. The benefits of taking L-Carnitine supplements are many. This is a type of amino acid that is typically produced naturally in your body, though for different reasons, you might have a deficiency. Here is more information about L-carnitine and why you might need a supplement. L-carnitine is still having studies done on the effects, but it has already shown to be beneficial for you in a number of different ways. First of all, it is often used by people who are prone to having seizures. Some people have difficulty with seizure medications because of the low level of this nutrient in the body, so they typically take an additional supplement. It can also help with infants who are born premature, as well as helping with cardiovascular health. L-carnitine is frequently given to people with congestive heart failure, who have had a heart attack or stroke, high cholesterol, and high blood pressure. It can help with blood flow, circulation, and even help with disorders like chronic fatigue syndrome and an overactive thyroid. There are a few different types of carnitine, but you really should only be concerned with L-carnitine. When you take this supplement, the nutrients will then travel to your gut, improving your gut health and helping with blood flow along the way. It helps improve intestinal bacteria, clearing your arteries of buildup, and preventing heart disease. This is why many times you will see L-carnitine in probiotics, which is also useful for dealing with gut bacteria. If you don’t want to take an L-carnitine supplement on its own, you can instead take a probiotic. Just make sure it has the required daily amount to be sure you get sufficient amounts of the nutrient. As far as natural food sources go, the best way to get the nutrient is through red meat, chicken, and seafood, though red meat like beef and pork does have higher amounts of it. There is up to 162 mg of L-carnitine in a single serving of red meat. You can also get this supplement from some dairy, like milk and cheese, though it is much lower. If you are a vegetarian or vegan, some other food sources for L-carnitine include black beans and hemp seeds. Talk to your doctor if you are concerned about not having enough L-carnitine in your diet. We noticed that most Carnitine supplements were so large they’d be difficult for most anyone to swallow; that’s why we took the same effective amino acid and broke it down into two easy-to-swallow capsules. As one of the most studied amino acids, Carnitine has been found to improve kidney function, speed up metabolism and impart energy, making it an ideal supplement for those looking to lose a few pounds while maintaining high energy levels all day long. 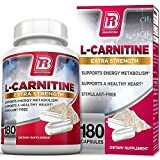 it’s no wonder that L-Carnitine is gaining in popularity as a supplement for people who want to promote heart health and lose weight at the same time.